The Mohawk Nation sent some of its best and brightest to meet Andrew Young, U.S. Ambassador to the United Nations, hoping to teach him a lesson in leadership. Young was one of Jimmy Carter’s trusted advisors on human rights, had already served in Congress and helped guide the Civil Rights Movement as one of Martin Luther King Jr.’s top lieutenants, which basically meant he helped lead the world down a new path. But this group of Native American leaders wanted to share something they felt he needed to know, and Young’s never forgotten it. “They told me that I did not represent them, but that I was making decisions in the U.N. about their native lands, and they wanted me to at least respect the wisdom of their ancestors,” he says. “They wanted me to know that the decisions I made would affect seven generations yet unborn. Young has spent all of his adult life thinking about future generations, so this information from the Mohawk Nation was something he understood at a molecular level. But it was a welcome third-party affirmation. Plus, he was genuinely touched by the civility of the ancestral guidance. He wishes he could say the same about the kingpins who have shambled to the top of the global pecking order, the so-called “one percent,” a culture of fiscal puppet masters that make Young cringe. That scarcity of a civil, common touch at the highest rungs is what irks him. In fact, it really gets him angry sometimes. But as he approaches 80, it’s also what drives him to keep trying to change the world, that widening gap between the richest and the poorest. And this African-American son of the South who developed Atlanta’s reputation as an international city is the same guy who believes it’ll take a Southern approach to fixing the mess. “The South was the battleground of ideas which made America great in the 20th century, so I think we need more Southern leadership at the national and global levels,” says Young. “I just think there ought to be some working people making the decisions of how the world is run. The thing about people like Jimmy Carter and Bill Clinton and Lyndon Johnson, they were all poor, they all had to work for a living, they understood the world at the ground level. “Instead, what we’ve got is a few very rich people who had rich parents and grandparents, who have trust funds, who never had to really work a job or run a business themselves, but they can dream up this derivatives crap, with no bad conscience. No great surprise that he feels education is part of the solution. Young serves on the Board of Trustees at Morehouse College (and the advisory board of its Andrew Young Center for International Affairs) and on the advisory board of the Andrew Young School of Policy Studies at Georgia State University. Young has been shepherding people for almost 60 years, first as a church pastor who organized voter registration drives. When he left his job in the pulpit, he joined the Southern Christian Leadership Conference (SCLC), where he helped develop new leaders, always with an emphasis on civility, a quality he believes has fallen on hard times because of economic policies that came into play almost 40 years ago. In the 1970s, he says, the U.S. and the world adopted private-sector dominant, free-market focused economic policies inspired by Milton Friedman, trading in the more kindly Keynesian approach. Young has been a peacemaker for most of his life, so this concept of leadership and public policy that connects and supports humanity is something he’s passionate about. He comes from the school of thought – in fact he is one of its leading professors – that believes you can have economic development and human rights, that they are, or should be, intimately related. In other words, there is a shortage of bona fide “trustees” on Mount Olympus, so when a leader emerges who demonstrates, for Young, those concepts of civility, non-partisanship and economic stewardship, he lights up – or lightens up. For his money, Atlanta Mayor Kasim Reed is one of those types of leaders and the right guy to follow in Young’s footsteps. “Half of the people in our state legislature don’t think beyond their county’s borders, but Kasim is different. He came from the state legislature into the mayor’s office and has vision that goes well beyond the usual borders,” says Young, alluding to the mayor’s willingness to work across jurisdictional borders on regional approaches and his active support for distant projects like the proposed Savannah port deepening [see story page 30]. Without Young’s guidance, though, Reed wouldn’t be in City Hall. Reed was a 20-year-old student and member of the board of trustees at Howard University when he first met Young. “We had a conversation about me becoming mayor way back then,” Reed says. “He told me when I was done with my work at Howard, I should come home because the city would need a mayor like me some day. Twenty years later, he sat next to me at my inauguration, and he continues to advise me in my political and personal life to this day. 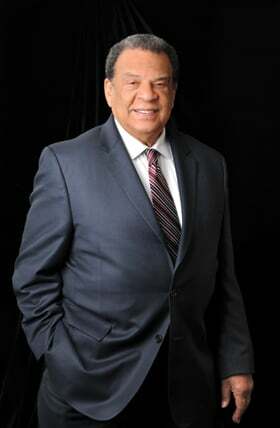 Andrew Young the former mayor and community leader, Reed says, is the reason a person in Singapore, Beijing or Warsaw knows where the city of Atlanta is. Young’s career as an ambassador ended on a sour note, but he makes no apologies. With Young’s help and advice, President Carter made human rights the focal point of U.S. foreign policy. The ambassador was the leading American voice in suggesting sanctions against South Africa’s practice of apartheid and was a guiding force in Third World economic development (something he continues as a business consultant and chairman of the Southern Africa Enterprise Development Fund). But in July 1979, hoping to foster Arab recognition of Israel, he met with Zehdi Terzi, a Columbia University professor and member of the Palestinian Liberation Organiza-tion (PLO). But U.S. policy was to not deal with the PLO until it officially recognized Israel, and when news of the meeting became public, U.S. Secretary of State Cyrus Vance suggested that Young should resign. “The state department leaked it to the press that I was undermining American policy,” Young says. “But I was not trying to be popular; I was not trying to win friends in the state department. I was trying to save a world that I thought was about to blow up and didn’t give a damn who liked it or who didn’t. He ran for mayor at the urging of Coretta Scott King and was elected in 1981, following Maynard Jackson into office, then served two terms, during which the city’s economy and population exploded. In two terms he helped attract 1,100 companies, a million jobs and $70 billion of new investment to the Atlanta area. Young was also able to capitalize on his U.N. experience to land the biggest fish of all. In 1987, Atlanta attorney Billy Payne had the wild idea that Atlanta should host the 1996 Summer Olympics. Young was one of the first to join the effort, and he proved to be the ringer over the next few years. “The Olympics success came directly out of my work at the U.N.,” Young says. Payne showed Young the list of 87 International Olympic Committee (IOC) members – kings and counts and CEOs and the like. Young started checking off the names of the people he knew, and those who knew someone that he knew. Young checked off 55 names. He got Payne in the door, and Atlanta got the Olympics. Young only has to look out the window of his Downtown Atlanta office at GoodWorks International, the consultancy firm he helped start, to see the lingering evidence of the Games. It has become what it is in large part because of Young, says his friend Reed. And for his part, Young credits the work and legacy of Martin Luther King Jr. for much of Atlanta’s success. Young learned the art of passive resistance and fighting for justice without violence from King, but learned how to keep his cool in the midst of the fight from his father, a prosperous dentist in New Orleans. The lesson proved helpful later on in his life, during the fight for Civil Rights, when the concept of dying was very real, but not very scary to him. “You have to have faith and the vision to be willing to move in the right direction,” says Young, who was with King when he was murdered in 1968, but always considered his work in the Civil Rights Movement as an easy burden. “He gave his life for the vision. I mean, I was really an innocent bystander that collected the benefits, though I was ready to lose my life. That’s the other thing – coming out of a Christian background, life and death, you know, it’s one transition into another.